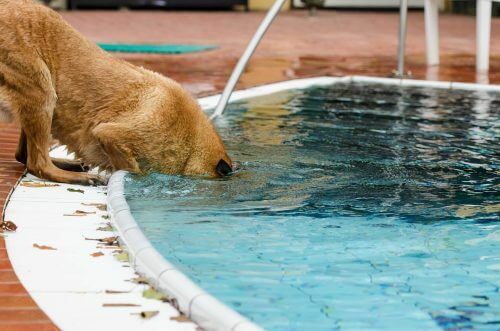 With a few exceptions, most dogs are natural swimmers. However, that does not mean all dogs like to swim. But, with a little patience, and some tasty treats, you can teach your dog to enjoy swimming. At the very least, it is important to teach your dog how to get out of a pool should they accidentally fall in. Even though most dogs can swim naturally, they don’t have much stamina and are in danger of drowning if the fall in and can’t find their way out. You can introduce your dog to water using a small children’s pool. Start by only putting an inch or two of water in the pool at first. Toss a special toy into the water. If he is still reluctant, you can take a high-value treat and lure him in, placing the treat by his nose and praising and rewarding for any attempt to step into the water. Consider using a life jacket to help reluctant swimmers. It will add buoyancy and help your dog gain confidence. Before using the lifejacket in the water, put it on your dog at home and get him comfortable with it by feeding him dinner while he wears it, or rewarding with treats. If you don’t have access to a pool, find a quiet, clean body of water without currents. It should have a gentle slope for ease of entry and exit and not a steep drop. Be prepared to join your dog in the water and bring a favorite toy. If your dog is cautious about entering the water, spend some time on shore and shallow areas and praise and treat with every step in the right direction. If you have access to a pool, start on the steps or shallow ledge with your dog on leash. Enter the water with your dog. Wade in a few steps and encourage your dog to follow with some tasty treats or a favorite toy. Reward him when he steps in the water, even if he only gets his toes wet. Gradually ask your dog to step further and further into the water until he has to start swimming to reach you. Working with another dog friend, who loves the water, can encourage your dog to relax and venture further. Most of all, keep it fun and don’t rush!